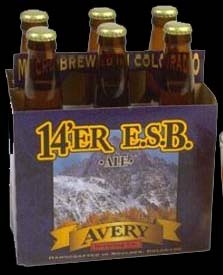 The 14'er pours a cloudy dark yellow color and settles into a clear, medium amber hue. The initially small, fizzy white head was quickly diminishing with fair lacing. The aroma is both malty and hoppy with light bread malts and piney hops. It didn't contain a harsh aroma, but was quite inviting. Initial light bitter taste was followed by a medium bitter taste for a long duration. Very long duration. The presence of hops was very strong on the palate. Light to medium in body with lively carbonation, the bitterness leaves the palate a little dry (as one expects). This beer definitely puts the 'bitter' back into the ESB.